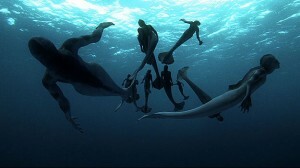 Home > News > Animal Planet Documentary - Mermaid Found? Animal Planet Documentary - Mermaid Found? An Animal Planet Documentary claims that Mermaids are actually real... Se the link at the bottom of this blog post to watch the full story! Mermaids have been a popular subject of art and literature for centuries. The legendary aquatic creature with the upper body of a woman and the tail of a fish appear in the folklore of many cultures worldwide, including the Near East, Europe, China, and India. On May 27, 2012, Discovery's Animal Planet aired “Mermaids: The Body Found”, a two-hour special that paints a somehow convincing picture of the existence of mermaids, what they may look like and why they’ve stayed hidden… until now. This documentary details the events three scientists witnessed and they believe they found evidence, both physical and vocal, of mermaids. Throughout this documentary, the scientists explain the theory of how mermaids came to be. Knowing that Discovery Channel is the world's #1 nonfiction media company, we thought that there may be truth about the revelation. Like you, we all are all skeptical about it, Discovery also quoted, “What if there’s a kernel of truth behind the legend of this mythic creature? Is the idea of mermaids really so far-fetched? Maybe so, maybe not.